Five time space shuttle astronaut and current NASA science chief John Grunsfeld – best known as the ‘Hubble Hugger’ for three critical and dramatic servicing and upgrade missions to the iconic Hubble Space Telescope – his decided to retire from the space agency he faithfully served since being selected as an astronaut in 1992. “John Grunsfeld will retire from NASA April 30, capping nearly four decades of science and exploration with the agency. His tenure includes serving as astronaut, chief scientist, and head of NASA’s Earth and space science activities,” NASA announced. Indeed, Grunsfeld was the last human to touch the telescope during the STS-125 servicing mission in 2009 when he served as lead spacewalker. The STS-125 mission successfully upgraded the observatory to the apex of its scientific capability during five spacewalks by four astronauts and extended the life of the aging telescope for many years. Hubble remains fully operable to this day! In April 2015, Hubble celebrated 25 years of operations, vastly outperforming its planned lifetime of 15 years. “Hubble has given us 25 years of great service. Hopefully we’ll get another 5 to 10 years of unraveling the mysteries of the Universe,” Grunsfeld told me during a recent interview at NASA Goddard. In his most recent assignment, Grunsfeld was NASA’s Science Chief working as the Associate Administrator for the Science Mission Directorate (SMD) at NASA Headquarters in Washington, D.C. since January 2012. “John leaves an extraordinary legacy of success that will forever remain a part of our nation’s historic science and exploration achievements,” said NASA Administrator Charlie Bolden, in a statement. Grunsfeld was inducted into the U.S. Astronaut Hall of Fame in 2015. He received his PhD in physics in 1988 and conducted extensive research as an astronomer in the fields of x-ray and gamma ray astronomy and high-energy cosmic ray studies. NASA said that Grunsfeld’s deputy Geoff Yoder will serve as SMD acting associate administrator until a successor is named. “After exploring strange new worlds and seeking out new life in the universe, I can now boldly go where I’ve rarely gone before – home,” said Grunsfeld. During his tenure as science chief leading NASA’s Science Mission Directorate Grunsfeld was responsible for managing over 100 NASA science missions including the Mars orbital and surface assets like the Curiosity and Opportunity Mars rovers, New Horizons at Pluto, MESSENGER, upcoming Mars 2020 rover and OSIRIS-Rex as well as Earth science missions like the Deep Space Climate Observatory, Orbiting Carbon Observatory-2, and Global Precipitation Measurement spacecraft -which resulted numerous groundbreaking science, findings and discoveries. Dr. Grunsfeld is a veteran of five spaceflights: STS-67 (1995), STS-81 (1997), STS-103 (1999) STS-109 (2002) and STS-125 (2009), during which time he logged more than 58 days in space, including 58 hours and 30 minutes of EVA in 8 spacewalks. He briefly retired from NASA in December 2009 to serve as Deputy Director of the Space Telescope Science Institute, in Baltimore, Maryland. He then returned to NASA in January 2012 to serve as SMD head for over four years until now. STS-67/Astro-2 Endeavour (March 2 to March 18, 1995) launched from Kennedy Space Center, Florida, and landed at Edwards Air Force Base, California. It was the second flight of the Astro observatory, a unique complement of three ultraviolet telescopes. During this record-setting 16-day mission, the crew conducted observations around the clock to study the far ultraviolet spectra of faint astronomical objects and the polarization of ultraviolet light coming from hot stars and distant galaxies. Mission duration was 399 hours and 9 minutes. STS-81 Atlantis (January 12 to January 22, 1997) was a 10-day mission, the fifth to dock with Russia’s Space Station Mir and the second to exchange U.S. astronauts. The mission also carried the Spacehab double module, providing additional middeck locker space for secondary experiments. In 5 days of docked operations, more than 3 tons of food, water, experiment equipment and samples were moved back and forth between the two spacecraft. Grunsfeld served as the flight engineer on this flight. Following 160 orbits of the Earth, the STS-81 mission concluded with a landing on Kennedy Space Center’s Runway 33, ending a 3.9-million-mile journey. Mission duration was 244 hours and 56 minutes. STS-103 Discovery (December 19 to December 27, 1999) was an 8-day mission, during which the crew successfully installed new gyroscopes and scientific instruments and upgraded systems on the Hubble Space Telescope (HST). 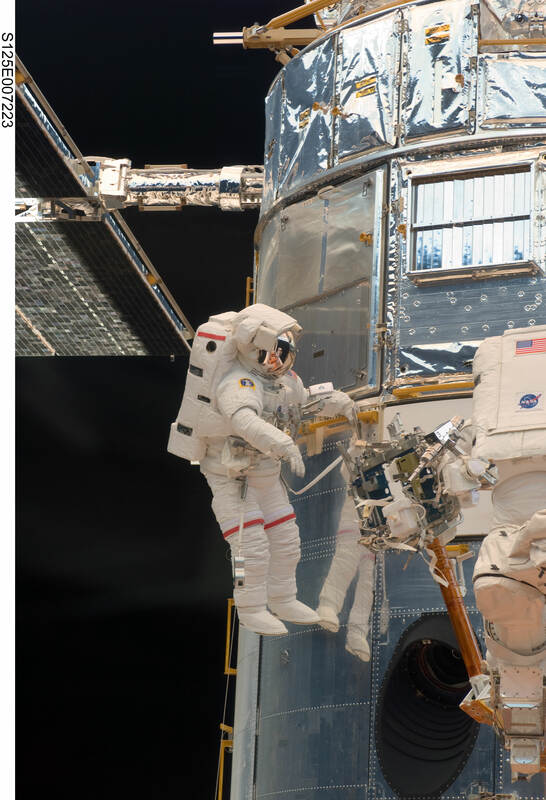 Enhancing HST scientific capabilities required three spacewalks (EVAs). Grunsfeld performed two spacewalks, totaling 16 hours and 23 minutes. The STS-103 mission was accomplished in 120 Earth orbits, traveling 3.2 million miles in 191 hours and 11 minutes. STS-109 Columbia (March 1 to March 12, 2002) was the fourth HST servicing mission. The crew of STS-109 successfully upgraded the HST, installing a new digital camera, a cooling system for the infrared camera, new solar arrays and a new power system. HST servicing and upgrades were accomplished by four crewmembers during a total of five EVAs in 5 consecutive days. As Payload Commander on STS-109, Grunsfeld was in charge of the spacewalking activities and the Hubble payload. He also performed three spacewalks totaling 21 hours and 9 minutes, including the installation of the new Power Control Unit. STS-109 orbited the Earth 165 times and covered 3.9 million miles in over 262 hours. STS-125 Atlantis (May 11 to May 24, 2009) was the fifth and final Hubble servicing mission. After 19 years in orbit, the telescope received a major renovation that included the installation of a new wide-field camera, a new ultraviolet telescope, new batteries, a guidance sensor, gyroscopes and other repairs. Grunsfeld served as the lead spacewalker in charge of the spacewalking and Hubble activities. He performed three of the five spacewalks on this flight, totaling 20 hours and 58 minutes. For the first time while in orbit, two scientific instruments were surgically repaired in the telescope. The STS-125 mission was accomplished in 12 days, 21 hours, 37 minutes and 09 seconds, traveling 5,276,000 miles in 197 Earth orbits.